When the Holy Spirit spoke to my heart in the Fall of 2013 that we were going to transition to a worldwide ministry that would specialize in focusing on the Remnant, I could have never imagined how this ministry would transform. Virtual Congregation: We converted Biblical Life Assembly from being a local congregation to a virtual church model. This refocusing of our mission gave birth to Biblical Life TV. The classroom, that once held a small congregation, is now a video studio. We are now ministering to the Remnant all around the world! Writing Ministry: The Holy Spirit also instructed me to begin a writing ministry. In January of 2015, The Shinar Directive: Preparing the Way for the Son of Perdition, was released through Defender Publishing. The book quickly became a best-seller. Countless evenings were spent in interviews on radio and podcast shows around the world. On February 29, 2016, we have sent the completed version of my new book, The Sheeriyth Imperative, to Defender Publishing. So we are preparing ourselves for the media promotion necessary to bring this vital work to the attention of the Body of Messiah. 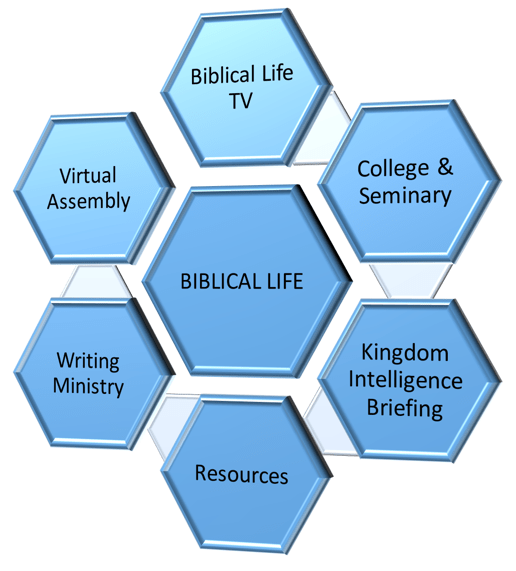 Biblical Life Resources: All of the courses that I have personally taught through Biblical Life College and Seminary were released to the public through Biblical Life Resources. Both individual believers, small home fellowships, and entire congregations are using those studies. The interest in these materials continues to grow every week. Kingdom Intelligence Briefing. A little over two years ago, I began experimenting with podcasting. The podcast quickly grew from my teaching on each episode to co-hosting with Mary on each show. We have gone from a few downloads each month to well over 13,000 every thirty days. Each month, the interest in KIB continues to grow. Biblical Life College and Seminary. With the growth of all of the other divisions of our ministry, Biblical Life College & Seminary has quickly become the place of learning for the Remnant. Interest and excitement about the Seminary seems to be increasing every quarter. This will allow us to have larger blocks of uninterrupted time for the many creative projects that are required for this type of ministry, as well as personal downtime to decompress. I personally have three pages of various projects that we had to place on hold over the last two years that can now finally be addressed. In the months to come, you will see a completely redesigned Biblical Life Assembly Website, a new College and Seminary catalog, and much more. It appears that our dynamic growth will continue through 2016 and beyond. These are exciting times to labor to nurture and empower the Remnant in the unfolding of biblical prophecy. The Lord bless you and keep you in all that you do. We will keep you in prayer for strength. Thank you for your love and devotion to the Lord Jesus, and to the body of Christ. I’m glad you are taking Jethro’s advice, Mr. Moses! (Ex. 18:18). We need you and Mary Lou around for as long as The Lord will allow. Thank you, Mary, staff and families for all you are doing for the body of Jesus. I will continue praying for all y’all: strength, endurance, shalom and blessings be poured out in abundance. Again: thank you. I thank you for your love and devotion the the Lord, and the body of Christ. I pray that the Lord will strengthen you, and Mary Lou,as you help the body to come into Biblical Truth. May He provide all that you need for life, and Godliness.